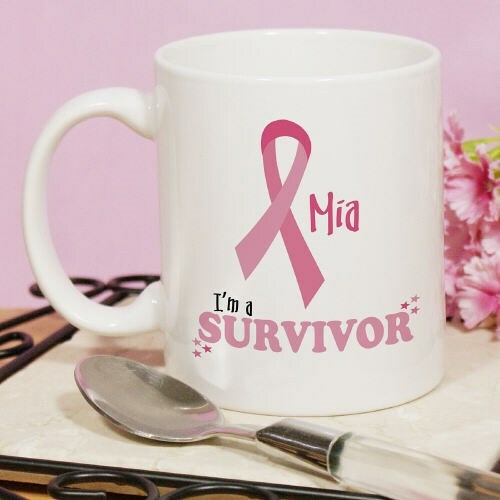 Show off your pride, strength and determination with your very own Personalized I'm A Survivor Breast Cancer Awareness Coffee Mug. A wonderful way to honor family & friends who have survived breast cancer. Your new personalized ceramic coffee mug is dishwasher safe, and holds 11 oz. Includes FREE Personalization. Personalize your Breast Cancer Survivor Mug with any name. Shop this and more Breast Cancer Survivor Gifts today! Additional Info MyWalkGear.com is a wonderful selection of Personalized Breast Cancer Gifts for family & friends. If you are preparing for a Breast Cancer Walk, we have the great designs perfect for your entire team of supporters.